Danny vs. the internet: Stonehenge! Again! Geologists Robert Ixer of the University of Leicester and Richard Bevins of the National Museum of Wales spent nine months using petrography (the study of mineral content and textural relationships within rocks) and managed to trace one of the original stones back to a rocky outcropping near Pembrokeshire, Wales called Craig Rhos-y-Felin. [160 miles from the Stonehenge site]. 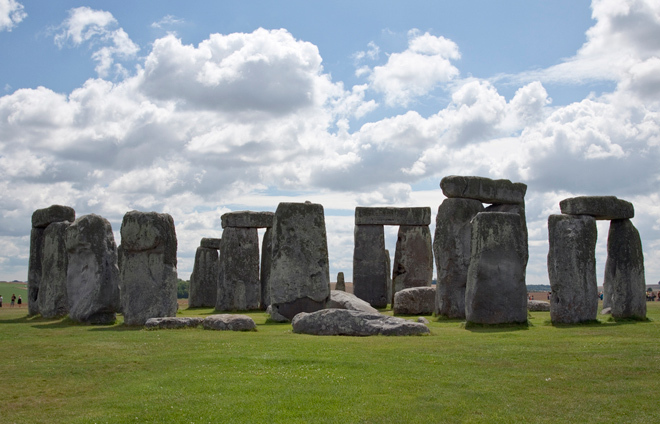 The discovery has re-invigorated one of academia's longest running debates - whether the smaller standing stones of Stonehenge were quarried and brought all the way there from Pembrokeshire by prehistoric humans or whether they had already been plucked out of ancient rock outcrops and carried all or part of the way to Wiltshire by glaciers hundreds of thousands of years earlier. Archaeologists tend to subscribe to the 'human transport' theory, while some geomorphologists favour the glacial one. The debate is solely about Stonehenge's early/smaller standing stones (often known collectively as 'bluestones') - not about the larger ones (most of the so-called 'sarsens') which were incorporated into the monument several centuries later. The more well-known and iconic stones, the huge sarsens, were incorporated into the monument several centuries later. They came from somewhere in the Marlborough Downs, 20 miles north of Stonehenge. They got the Soup Nazi?! Game of Thrones Season 2 trailer! Seal team 6 for President! Jesus Christ, get me some cow's milk! Who says a hatchback can't be awesome?! Troy and Abed in the Morning! Why are they all on the road at the same time?! Are skyscrapers an indicator of economic strife?